Klinger is a thickened clinging 9% hydrochloric acid formula used for cleaning bowls, urinals and other porcelain surfaces in washrooms. This low acid formulation is easy to use and easily clings to vertical surfaces for full and effective cleaning and deodorizing. Ideal for removing scale, calcium, lime, iron/rust or uric acid build-ups. Removes stained porcelain quickly with no fuming. Fortified with detergents, penetrants and other wetting agents to be effective on soap scum, oil and dirt found in industrial environments. Our other bowl cleaners offer different cleaning options. Please ake a look at resource center for complete and thorough instructions on restroom cleaning. *Please Note: This product contains 9% hydrochloric acid, which is very aggressive and can cause pitting and corroding on metal surfaces. Should only be applied to porcelain surfaces. Pour 2-3 oz. of Klinger into toilet bowl and swab with bowl brush until clean and free of stains. Clean area under flush rim. For heavy stains, remove as much water as possible and repeat steps above. Flush or rinse when finished. Pour 2-3 oz. of Klinger into urinal or on a wet swab/bowl brush in the urinal. Repeat steps if stubborn stains persist. This product can expose you to chemicals including Methanol, which is known to the state of California to cause birth defects or other reproduction harm. For more information go to www.P65Warnings.ca.gov. Customers who were interested in the Trusted Clean 'Klinger' Detergent Thickened Bowl Cleaner - 12 Quarts were also interested in the following items. 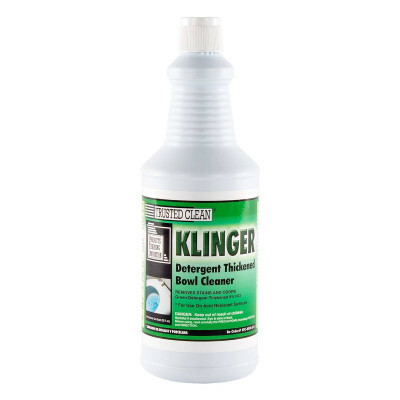 This is a review for the Trusted Clean 'Klinger' Detergent Thickened Bowl Cleaner - 12 Quarts.